By Rick Davis, Consumer Metrics Institute BEA Estimates 3rd Quarter 2016 GDP Growth to be 3.15%: In their second estimate of the US GDP for the third quarter of 2016, the Bureau of Economic Analysis (BEA) reported that the growth rate was +3.15%, up +0.24% from their previous estimate and up +1.73% from the prior quarter. 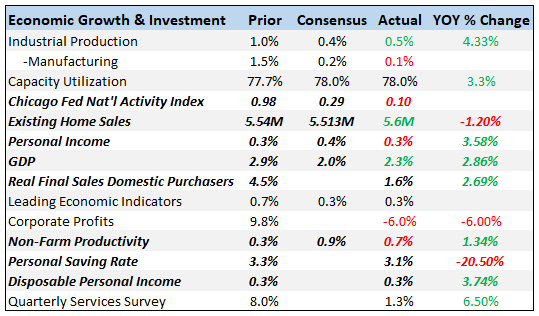 Follow up: Most of the improvement in the headline number came from a +0.42% upward revision to consumer spending. Spending on consumer goods was revised upward by +0.26%, and spending on consumer services was reported to be +0.16% better than previously thought. However, both of these numbers remain below the growth levels recorded in the prior quarter (and were in aggregate -0.99% lower than 2Q-2016). The generally noisy inventory growth rate was revised downward by -0.12% to +0.49%. None of the revisions to the other line items in the report were material. The BEA's treatment of inventories can introduce noise and seriously distort the headline number over short terms -- which the BEA admits by also publishing a secondary headline that excludes the impact of inventories. The BEA's "bottom line" (their "Real Final Sales of Domestic Product") was a +2.66% growth rate, up +0.36% from the previous estimate and now up +0.08% from 2Q-2016. In their second estimate of the US GDP for the third quarter of 2016, the Bureau of Economic Analysis (BEA) reported that the growth rate was +3.15%, up +0.24% from their previous estimate and up +1.73% from the prior quarter. Most of the improvement in the headline number came from a +0.42% upward revision to consumer spending. Spending on consumer goods was revised upward by +0.26%, and spending on consumer services was reported to be +0.16% better than previously thought. However, both of these numbers remain below the growth levels recorded in the prior quarter (and were in aggregate -0.99% lower than 2Q-2016). The generally noisy inventory growth rate was revised downward by -0.12% to +0.49%. None of the revisions to the other line items in the report were material. The BEA's treatment of inventories can introduce noise and seriously distort the headline number over short terms -- which the BEA admits by also publishing a secondary headline that excludes the impact of inventories. The BEA's "bottom line" (their "Real Final Sales of Domestic Product") was a +2.66% growth rate, up +0.36% from the previous estimate and now up +0.08% from 2Q-2016. Real annualized household disposable income was reported to have grown by $176 quarter-to-quarter, to an annualized $39,234 (in 2009 dollars). Not all of that increase was spent; the household savings rate increased +0.2% to 5.9%. For this revision the BEA assumed a slightly lower effective annualized deflator of 1.39%. During the same quarter (July 2016 through September 2016) the inflation recorded by the Bureau of Labor Statistics (BLS) in their CPI-U index was 1.84%. Underestimating inflation results in correspondingly optimistic growth rates, and if the BEA's "nominal" data was deflated using CPI-U inflation information the headline growth number would have been lower, at a +2.74% annualized growth rate. The headline contribution from consumer expenditures for goods increased to a +0.74% growth rate (although it is still down a material -0.77% from the prior quarter). The contribution to the headline from consumer spending on services improved to +1.15% (which also remains down -0.22% from the prior quarter). The combined consumer contribution to the headline number was +1.89%, down a significant -0.99% from 2Q-2016. The headline contribution from commercial private fixed investments remained negative at -0.15%. Although this is a slightly smaller contraction than during the previous quarter, it still represents the fourth consecutive quarter of contraction in commercial fixed investments. The contribution from inventories softened somewhat, adding +0.49% to the headline (while still up a dramatic +1.65% from 2Q-2016 -- after a string of five consecutive quarters of contraction). It is important to remember that the BEA's inventory numbers are exceptionally noisy (and susceptible to significant distortions/anomalies caused by commodity price or currency swings) while ultimately representing a zero reverting (and long-term essentially zero sum) series. The positive headline contribution from governmental spending was essentially halved; it was revised downward by -0.04% to +0.05%. This was still up an historically large +0.35% from the prior quarter. This momentary growth was almost certainly due to increased Federal fiscal year-end ("spend every last budgeted dime -- even if we can't possibly use whatever it is that we are buying") spending -- a recurring annual phenomenon that is accompanied by an offsetting fourth calendar quarter (first fiscal quarter) reversal of that growth. The contribution to the headline number from exports improved slightly to +1.18% (up +0.01% in this revision and +0.97% from the prior quarter). Imports subtracted -0.31% from the headline number, up +0.03% in this revision but down -0.28% from the prior quarter. The "real final sales of domestic product" was revised upward +0.36% to +2.66%, and it is up +0.08% from the prior quarter. This is the BEA's "bottom line" measurement of the economy and it excludes the reported inventory growth. As mentioned above, real per-capita annual disposable income was reported to have grown $176 quarter-to-quarter in this report. At the same time the household savings rate was revised to 5.9%, the same level recorded in the second quarter of 2016. It is important to keep this line item in perspective: real per-capita annual disposable income is up only +6.97% in aggregate since the second quarter of 2008 -- a meager annualized +0.82% growth rate over the past 33 quarters. The prior quarter's growth in consumer spending still took a major quarter-to-quarter hit (it was down nearly a full percent). We believe that it is plausible that the "fear, uncertainty and doubt" (FUD) surrounding an especially uncivil election campaign contributed to lousy consumer sentiments and a corresponding spending malaise. If so, some of that has certainly carried over into the current quarter as well. Although the BEA is really proud of their "seasonal adjustments," somehow the highly predictable Federal fiscal year-end spending shenanigans completely escapes them. This momentary "growth" in Federal spending has merely been brought forward from the 4Q-2016. Commercial fixed investment remains weak, and it has now recorded four consecutive quarterly contractions. Most of the quarter-to-quarter improvements in the contributions to the headline number came from two especially noisy line items: inventories and exports. The quarter-to-quarter swing in those two line items in aggregate represent +2.62% of the headline number. When the quarter-to-quarter +0.35% "improvement" in governmental spending is included, it could be argued that the vast majority of the 3% headline number is from either noisy data or simply borrowed from the next quarter. In summary, a good report with somewhat better consumer spending but equally unsettling commercial fixed investments.